God’s Creation | God's Abundant Blessings! I love to worship God. I love to see His glory in His creation. I saw this beautiful clematis. But it wasn’t until I stopped, moved the camera lens in closer, that I saw the incredible detail. Why does God take the time to create such beauty, that we too often miss? God made us to worship and glorify Him. I think God creates incredible beauty for us to find when we slow down and and enjoy the world around us. I love how some of the other Bible versions tell how to Ascribe Glory to God – Honor, Worship, Give, Praise. Take some time to spend before the face of God. It is a great time to walk through the park or the woods. Enjoy the flower gardens. Walk down by the creek or lake and look at the rocks and critters. Our 7-year-old gets this. Whenever she is over, she spends a long time looking at all the rocks under the deck, looking for fossils. She’s found some incredibly tiny ones. She was just at a lake and loved finding tiny shells and snails. One of the best days to do this is on Sunday. God made the Sabbath for rest, recovery and time to spend enjoying Him. Take some time this coming Sunday to enjoy God’s beautifully unique creation up close and personal. However, I had been struggling with feelings of hopelessness and being overwhelmed by some situations. God’s peace was nowhere to be found in my current state of mind. I walked through the local park and took many pictures of God’s creation. I sat on a swing and read from His word for a few hours and prayed. I sang, did some sketching and took more pictures. I began to feel at rest in trusting God to handle the situation. However, I still was not filled with JOY and wondered if God really heard my desperate heart. Well as I was pouring out my frustrations, worries and fears to God, He saw fit to remind me that He was there, listening to everything I had been saying. I was about ten feet from my car when a beautiful Black Swallowtail flew around my face and landed on the flowers in front of me. He stayed there sipping from each little flower of the one plant closest to me. As I moved closer, he just moved to another blossom, but he didn’t fly away – until I took the time to thank God for the reminder that He is always with us. He ALWAYS hears us. Now, don’t get me wrong. I didn’t think the butterfly was God or a form of God. It was just “odd” how it showed up when I hadn’t seen any butterflies for the past half hour and then only a Monarch and a Yellow Swallowtail. As I was telling God how I really felt, this beautiful butterfly shows up and stays right where I am for quite a while. And when I thank God for His loving care, guidance and protection, the butterfly flew away. I must say, I was abundantly blessed by His reminder of His presence through creation. Have you ever really thought about what heaven will be like? 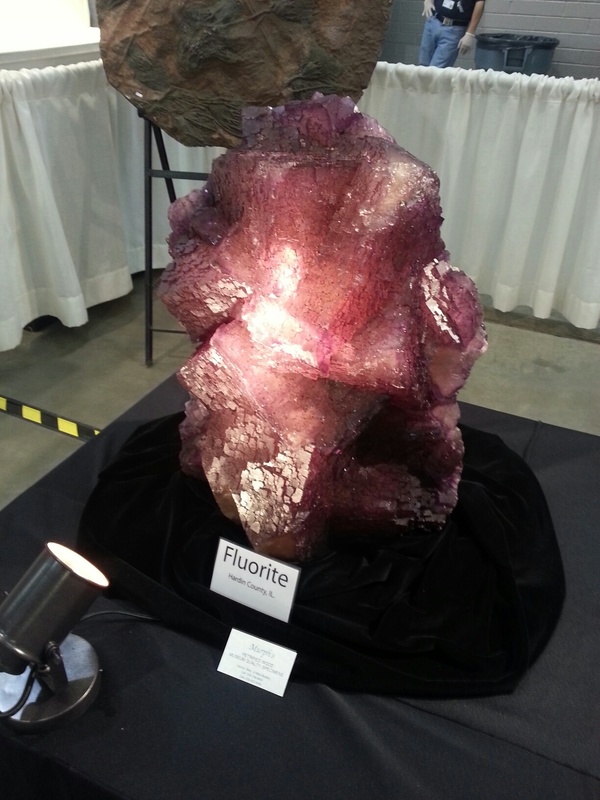 I couldn’t help but think about what heaven will be like when I saw this enormous amethyst. Revelation 21 went through my mind with the streets of gold and the walls of precious stones. I have to admit, the rock below is beautiful. However, when I reread Revelation 21 I am reminded that the holy city of Jerusalem “shone with the glory of God and sparkled like a precious stone”. Nothing – absolutely NOTHING – on this earth can compare with the glory we will see heaven. 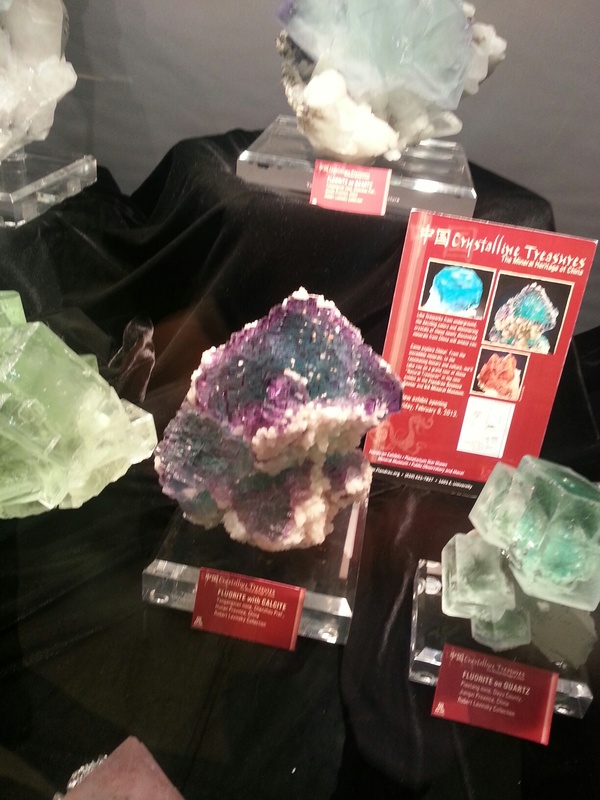 The wonderful creation of precious gems and minerals that we enjoy today will blow our minds away when we see heaven. Oh that will be glory for me! Wonderful riches more than tongue can tell, He is my Father, so their mine as well. He owns the cattle on a thousand hills, I know that He will care for me. How wonderful to know that all that we have comes from God, our Father, who cares for and shares exceedingly, abundantly with His children. I love the beauty of garden flowers. The vibrant colors, the variety, the fragrance are all so inspiring and brighten my mood. I love it when my husband picks up a bouquet of flowers for me to enjoy in the house, especially during the grey winter/spring months. This happened in March, Rich brought me flowers and I enjoyed those beauties for over 2 weeks. I would take pictures every day. I would change the water and prune and care for them to make them last longer. They were a timely blessing because I ended up with a severe case of the flu 2 days later and they were an incredible bright spot and reminder of Rich’s love for me. Simple flowers – can change lives. God knows that we pay attention to the beauty of flowers. We also know that they don’t last forever, and when they die we compost them or throw them away. We learn early on that a seed planted in the ground yields a plant when it is watered and the sun shines on it, all orchestrated by God. 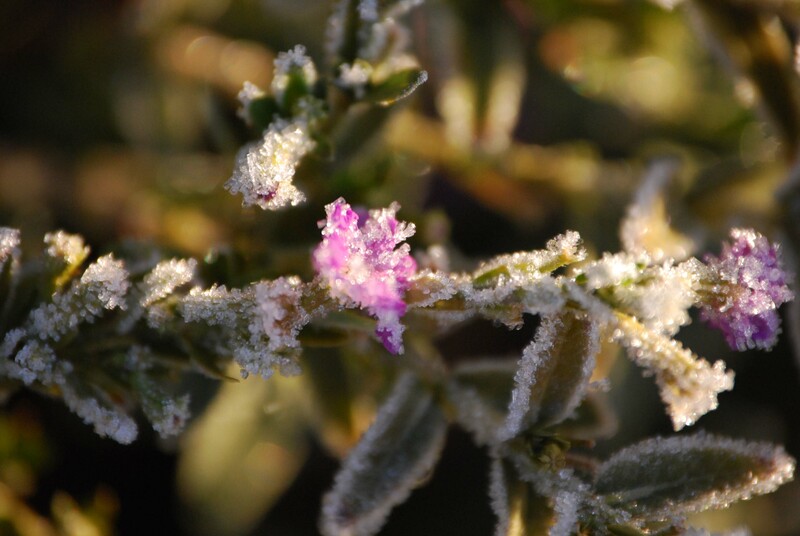 Yet, as much as God tenderly and lovingly cares for the plants, He wants us to know for certain that He cares for each and every one of us much more than He cares for the plants that are here today and gone tomorrow. A time for everything – praise, rejoicing, celebrating, loving, crying, sorrow, concern, care, thinking, acting … and so much more. People are dealing with financial struggles, health issues, facing news of terminal illness, marriage or family relationships, job insecurity and so many other trials. But they are also celebrating babies births, marriages, new puppies, spring around the corner with all the new life, blessings of friendships, family, good jobs. Remember for every season of life – God is there and has gone before you preparing the way for you. Just (a very simple word) – JUST TRUST HIM! I thoroughly enjoyed walking through the prairie yesterday and seeing God’s creation all around me from flowers, grasshoppers, bees, butterflies, moths and even the deer I scared up and ran off just as afraid of me. It made me think of how much God takes care of and that He is always watching over each one of us as well as all of His creation. And my God will meet all your needs according to His glorious riches in Christ Jesus. To our God and Father be glory for ever and ever. Amen. The author reminded me not to worry about the state the world is in or health or relationships or … the list goes on and on. You can enter whatever trials you are facing right now. What? Not worry? But then I think I am helping in the situation. No, instead of worry – praise God for being the God Who Provides! If God can provide for the needs of these little creatures – how much more will He provide for our needs whom He created with His breath of life. When relationships go through difficulties – spouses hurt us, children don’t obey or worse lie to us, friends betray us – praise God for He is in control. He takes care of all the details – big and small. That is so counter to our culture today. We want to micromanage our lives, but we have so much more peace and are filled with greater blessings when we give our lives over to God and lift our hearts in praise to Him. God is blessed when we praise Him! For this shows Him we are being obedient and trusting Him with our lives. I wonder what life would have been like if Joseph had moped around or paced with fear and dread about what his future would have been like? He had no clue that the bitterness and hatred of his brothers would end up being used as an incredible blessing from God for himself, his brothers and their family as well as the Israelite nation at the time. Joseph would face a real pit, hatred and betrayal from his brothers, the realization of the pain his father must have gone through not knowing about him, prominent positions and then prison, favored and rejected … Yet he was able to say – you meant it for harm but God used it for good. Another year begins with all its uncertainties, expectations and anticipations. It is another year we will need to decide how we react to life’s challenges and blessings. Blessings are obviously much easier to accept than challenges. Living in the Midwest, it looks like we will face incredibly cold temperatures this weekend (-24° with windchills predicted -40 to -50°). This is the time of year we start hoping for Spring and the January thaw. 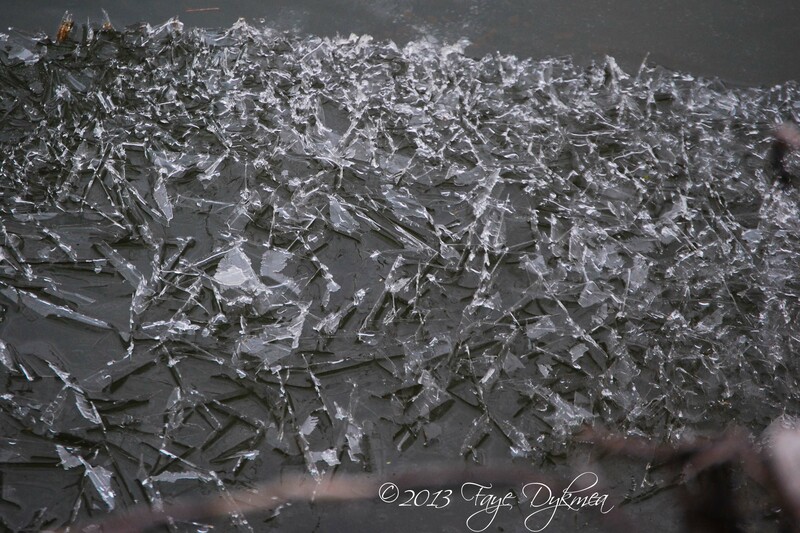 We look at the ice on the river and realize that we don’t know what type of spring we will face this. Last year we had some flooding and with memories solidly in our minds from 2008 devastating floods we can easily let our minds dwell on worrying what will happen. We can become totally overwhelmed with the negatives even to the point of missing the beauty God breathes into the ice formations around us. An interesting story occurred over Christmas. A Russian ship filled with 22 crew and 52 passengers (scientists and tourists) became stranded in the thick ice of Antarctica. Three icebreakers were initially dispatched to try and crack their way through the thick ice surrounding the ship, but all failed. After more than a week, the passengers were finally airlifted to a Chinese icebreaker by helicopter. The trapped passengers and crew had to stamp out a landing pad in the snow/ice for the helicopter to land. The helicopter had to make several trips to ferry the passengers to freedom. Watching video clips posted by some of the passengers showed them making the most of their trial. They weren’t despondent; crying “where is help coming from?”. They made the most of their time performing more science experiments and having fun with their circumstances. WHY? They were stranded in subfreezing temperatures, away from family at the holidays and initial rescue attempts definitely were NOT encouraging when the first ice-breaker became stuck as well. They chose to enjoy the days filled with HOPE and JOY. 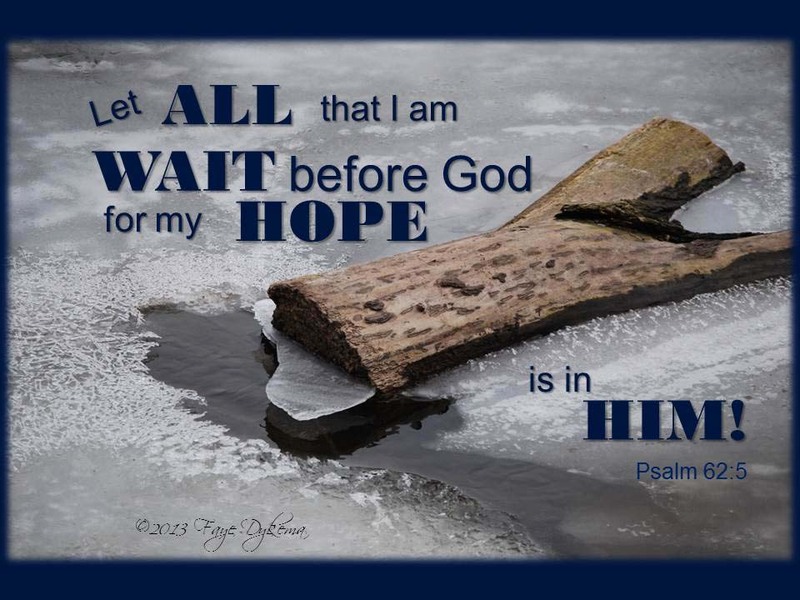 Let ALL that I am WAIT before God, for my HOPE is in HIM! I have this verse written on my mirror where I see it every morning and several times throughout the day. I have taken it apart word by word, emphasizing different words and phrases. God has blessed me incredibly through these words. No, I didn’t hear from the loved one, but because of God’s assurance, I continue to WAIT in HOPE. I have chosen to HOPE as I WAIT before GOD. God is working in this person’s life and in mine. I will WAIT with HOPE that the work God is performing in each of us will be in accordance with God’s will and for His purposes. It’s that time of year – Advent. Christians around the world look with longing, expectation, anticipation and hope for the celebration of the coming King of kings. We long to see the glory of God that the angels sang of when they heralded the news of Christ’s birth to the shepherds. I’ve been studying the Ark of the Covenant and the Tabernacle established by God when the Israelites were in the desert after their exodus from Egypt. The Ark of the Covenant was the throne of God. (Exodus 25:10-22) It was covered by the mercy seat and two cherubim made of pure gold were placed on top of it facing each other. The glory of the Lord resided between the two cherubim. Only the High Priest was allowed to enter the Holy of Holies and come before the presence and glory of God. The Ark represented God’s holiness, purity and presence among the people. 2 Samuel 6:1-19 shows what happened to Uzzah when he didn’t treat the Ark of the Covenant with the awesome respect God required. Moses had been speaking with the Lord on several occasions (Read Exodus 33). Moses prayed in Exodus 33:18, “I pray You, show me Your glory!” So the Lord had Moses stand near Him on the rock and as God’s glorious presence passed by, God hid him in the crevice of the rock and covered him with His hand. When God removed His hand Moses could look at God from behind and see His glory and live. Exodus 34:30 indicates Moses’ face was so radiant after being with the Lord, that the people asked him to cover his face. Doxa ~ describing glory is the other word (New Testament). The Greek word doxa, – “that which is apparent, brilliant, radiant, resplendent”; (i.e., as manifested in the splendor of Solomon in all his glory Matthew 6:29/Luke 12:27). The glory of God’s attributes is made known to the world through the radiant splendor of His creation. We get our word doxology-the song we sing at the end of our worship services, being with God, hearing His word and so we sing our praises to the glory of God for who He is and what He has done for us. Psalm 19 describes how all of creation recognizes the need to glorify God for who He is and what He has done. Glory, (Heb. kabhod; Gr. doxa). (1.) Abundance, wealth, treasure, and hence honour (Ps. 49:12); glory (Gen. 31:1; Matt. 4:8; Rev. 21:24, 26). (2.) Honour, dignity (1 Kings 3:13; Heb. 2:7 1 Pet. 1:24); of God (Ps. 19: 1; 29:1); of the mind or heart (Gen. 49: 6; Ps. 7:5; Acts 2:46). (3.) Splendour, brightness, majesty (Gen. 45:13; Isa. 4:5; Acts 22:11; 2 Cor.3:7); of Jehovah (Isa. 59:19; 60:1; 2 Thess. 1:9). (4.) The glorious moral attributes, the infinite perfections of God (Isa. 40:5; Acts 7:2; Rom. 1:23; 9:23; Eph. 1:12). Jesus is the “brightness of the Father’s glory” (Heb. 1:3; John 1:14; 2:11). (5.) 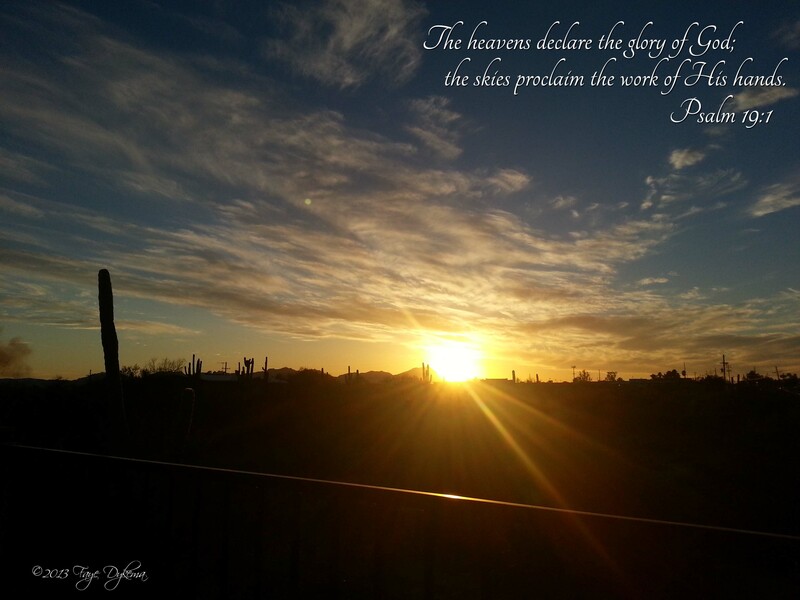 The bliss of heaven (Rom. 2:7, 10; 5:2; 8:18; Heb. 2:10; 1 Pet. 5:1, 10). (6.) The phrase “Give glory to God” (Josh. 7:19; Jer. 13:16) is a Hebrew idiom meaning, “Confess your sins.” The words of the Jews to the blind man, “Give God the praise” (John 9:24), are an adjuration to confess. They are equivalent to, “Confess that you are an impostor,” “Give God the glory by speaking the truth;” for they denied that a miracle had been wrought. What incredible beauty there is in God’s creation! 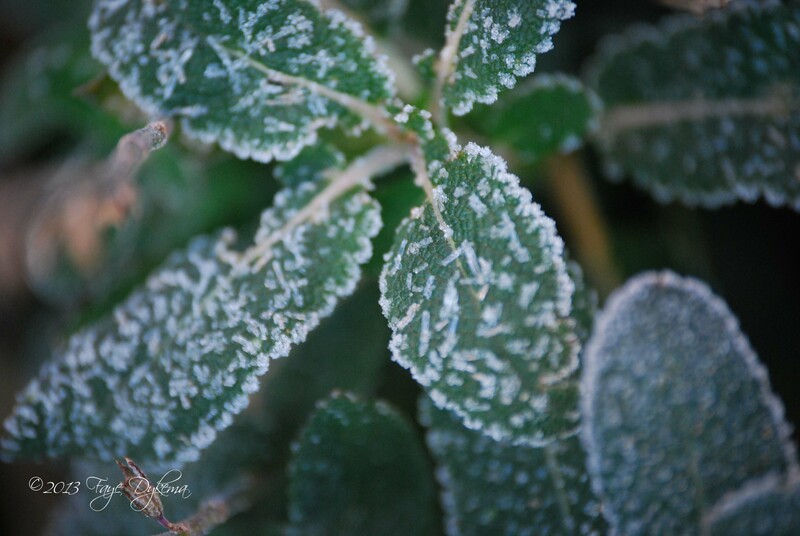 In the past month, I’ve gone from enjoying His glory in a sunrise at the lake to walking through the plants at work and seeing the incredible detail on a crisp, frosty morning. This summer due to a lot of circumstances, I have felt myself drawing away from God. After talking about it with a few precious friends, they each asked if I was getting out with my camera lately. I had to admit I haven’t. Not like I had in the past. I can come up with a list of reasons/excuses why, but really it comes down to enjoying the adrenalin of being busy helping others. When I reflect on that, I realize that I am missing so much of what I was created to do — The chief end of man is to glorify God and enjoy Him forever. (Westminster Catechism) I have allowed myself to be so busy at work, in projects, in planning worship services, etc., that I have not had my primary focus be on giving God glory and enjoying/celebrating Him for ALL He has done. Yesterday our minister preached from Isaiah 52 & 53 on how much our Lord and Savior, Jesus Christ, did for us. How He endured incredible suffering-mocked, whipped, beaten. Jesus, our Lord, bled and died for our sins. When He paid such an incredibly selfless price for each one of us, why don’t we take time to glorify God in all things? As we all heard the message we realized the depth of God’s love. From the beginning of the worship service to the end there was an incredible transformation in the people’s worship from enjoying singing about God to hearts being lifted up glorifying God in praise for the Power of the Cross. 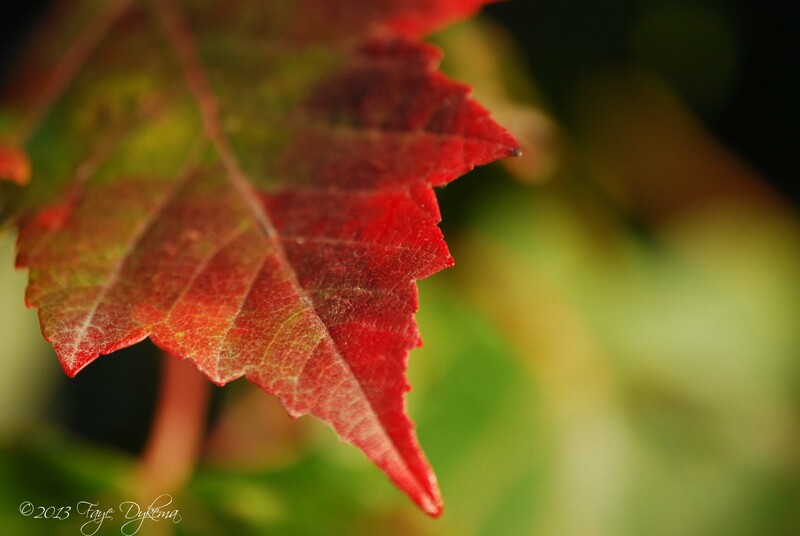 We have so much to glorify God for from the beauty of creation to His unconditional love and abundant grace. the Holy One, is here. with splendor He is crowned. The morning I took the photo of the sunrise, I was visiting friends. I was blessed to wake up before the sunrise and just wait in the peacefulness of the lake and wait for the sun to appear. There is such an incredible calm that comes during that time of waiting as the sky turns from navy blue/black to light hues of gold and the fog rolls in on the lake. It is incredible just to silently breathe in God’s presence and peace and even without words being said just glorify God for ALL He has done for us. God has blessed us abundantly with His creation, love, mercy and grace. 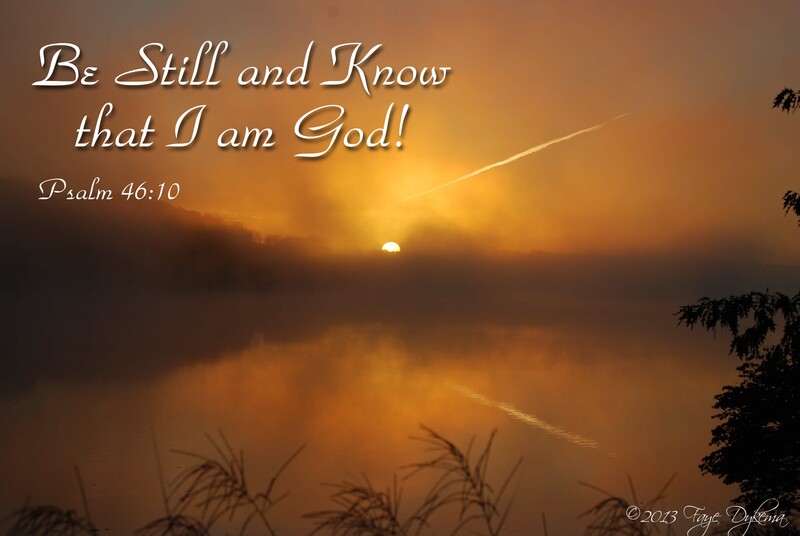 We need to take the time to Be Still and Know that He is God! Ever wonder WHERE God is in your life? Does He CARE? Does He KNOW what is going on? Prayers go unanswered. People betray and hurt you. Sickness affects loved ones. People die. Does it seem like God is totally absent? I’ve been there recently. Since I’ve been in such a funk, I’ve begun taking a day away from work and daily responsibilities; a day where I spend several hours just in quiet with God. Peace. Serenity. Calm. I head to a local park. Look out at the lake. I take along my Bible, a journal and pen, and my camera. But most importantly I take an open heart ready to not only talk to God but to just sit still and listen to Him. Where is He prompting me? Guiding Me? Challenging Me? Reminding Me? A week ago this exercise prompted the following thoughts about being a reflection of God to others through my life. I definitely had NOT been a clear reflection of God since I had been very much wrapped up in my hurts, my worries, my fears, my misery. (Misery does not love company, it just likes to fester and grow all on its own.) 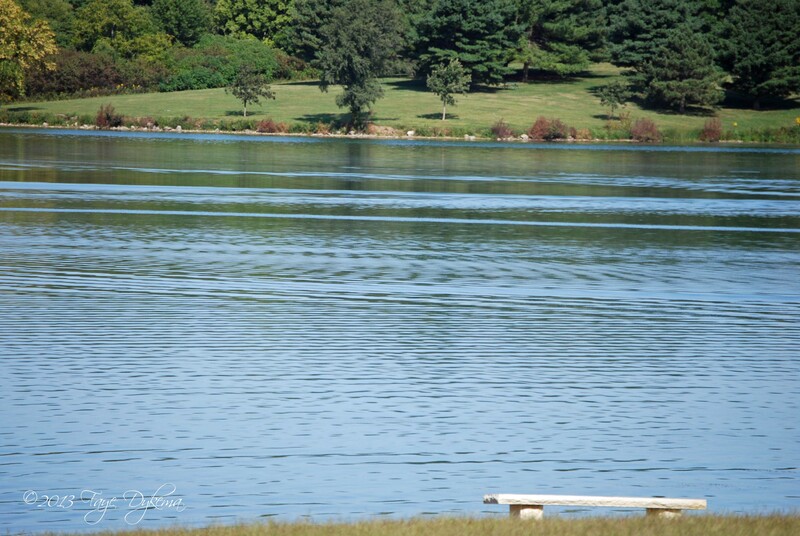 As I just sat and talked with God, I felt Him telling me to look closely at the reflection of the lake. A wind had just picked up and the crisp, clear reflection was lightly disturbed by the gentle breeze. Is this what sin, misery, despair, grief, avoiding God, busyness in my life had done? Do these things disturb my reflection of God in my life? When the storms of life blow into us, where is that peaceful, clear reflection of God? 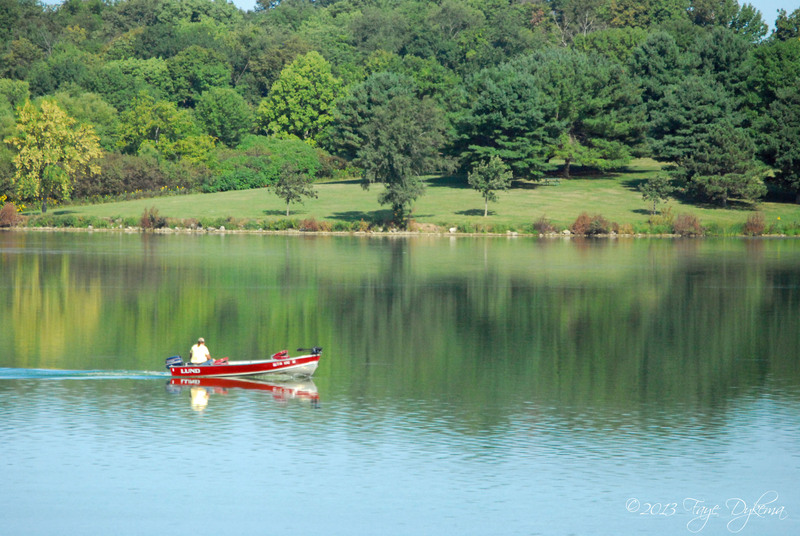 As I watched, a motor boat crossed the reflection and really disturbed the serenity of the mirror image on the shore. The wake fanned out and spread, much like self-pity does. After a while, it took over most of the reflection and it took a long time before the lake returned to the mirror-like image of the shore. 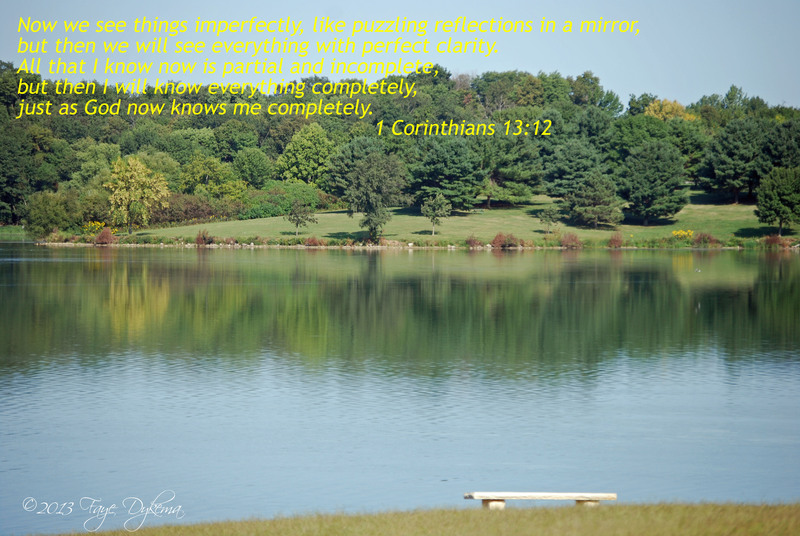 I wondered – where am I in my reflection of God? I realized I had lost the shoreline. I had let every big and little disturbance create choppy waves in my life and God wasn’t being reflected through me. I was letting my worldly cares and concerns disturb God’s peace. I was letting my feelings and self-centered pity create a disturbance in my reflection of God. I was listening to one of Joyce Meyer’s talks and heard God’s reminder, … don’t care how I FEEL. 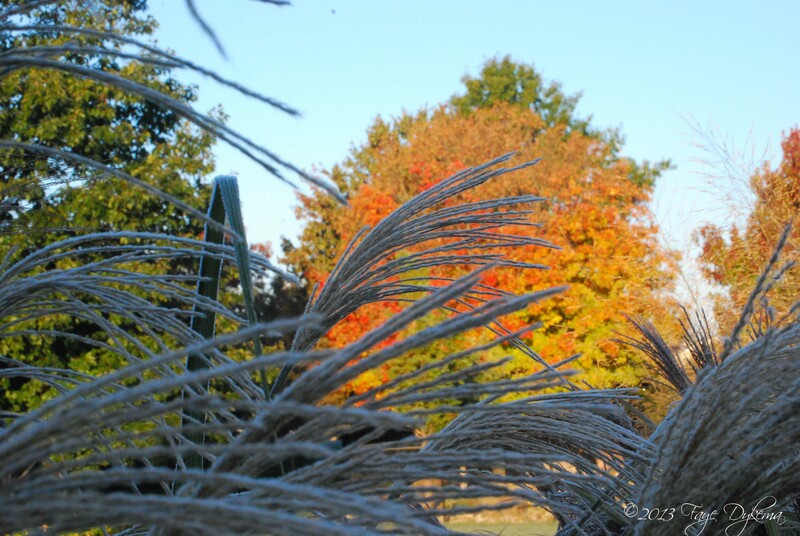 Remember – I am rooted in God’s love. His love makes me more than a conqueror. He loves me unconditionally. While I was still an enemy of the cross, He died for me and loved me anyway. God will never love me any more than He does right now at this moment. God loved me so much – He let His Son die for me to have eternal life. Why am I stuck in self-pity and blaming God for ignoring my life? I need to continue to be fully in God’s word and presence. I need to be still and listen for His leading and guiding in my life so that I can be a true reflection of His love in my life and to those around me. I need to put on the armor of God so I can stand against Satan’s lies. I am reminded of 1 Corinthians 15:12 where it says one day we will see everything clearly. In this world, “with devils filled that threatens to undo us,” we can’t fear if we are filled with God’s love, grace and truths. We won’t always understand or “FEEL” that God cares. That’ won’t happen until I am perfectly remade with God. But I do KNOW God knows and loves me always and unconditionally. Praise God! A couple years ago my husband and I took a trip out West to enjoy God’s beautiful creation in Colorado, Utah, Arizona and Nevada. 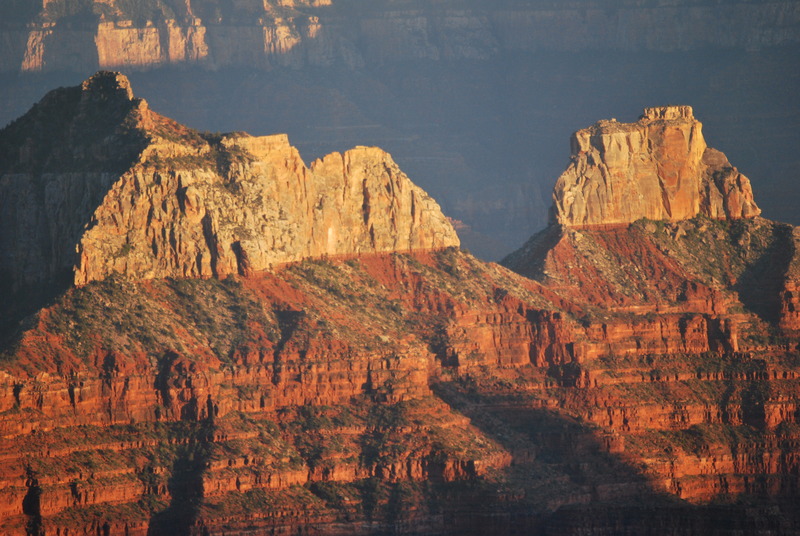 We were privileged one evening to spend time on the North Rim of the Grand Canyon watching the sunset. It is incredible to watch the colors change in intensity in the depths of the canyon as the sun reaches into its depths and then slowly hides behind the heights of the canyon. It was totally indescribable, magnificent! Photos are great to remember the event, but they don’t do justice to actually being there. It reminds me of describing to a nonbeliever the incredible love of God. How could the Creator of the universe, know each and every person ever conceived? How can He know the number of hairs on our head? How can He write our names on His heart? He is totally indescribable! His love is beyond all knowledge or understanding. He gave His one and only Son, Jesus Christ, to die and rise again so that we may be saved and live with Him forever in eternity – inconceivable, amazing love! When I think of all this, I fall to my knees and pray to the Father, the Creator of everything in heaven and on earth. I pray that from His glorious, unlimited resources He will empower you with inner strength through His Spirit. Then Christ will make His home in your hearts as you trust in Him. Your roots will grow down into God’s love and keep you strong. 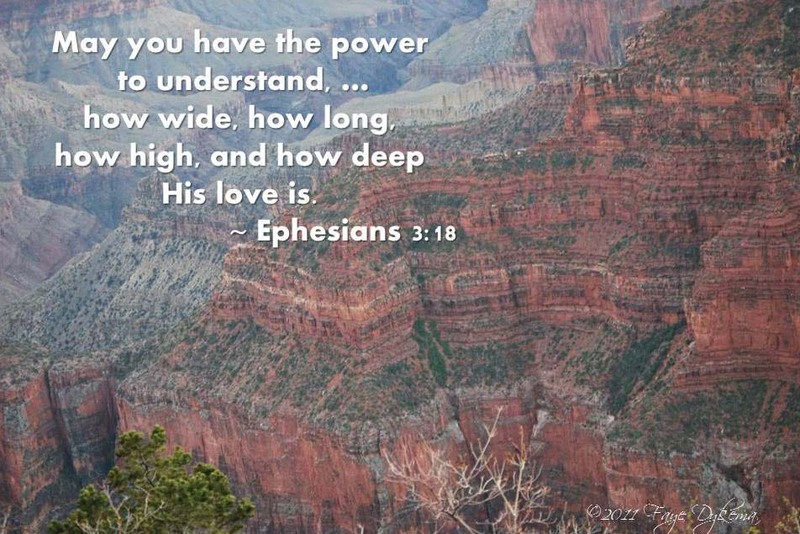 And may you have the power to understand, as all God’s people should, how wide, how long, how high, and how deep His love is. May you experience the love of Christ, though it is too great to understand fully. Then you will be made complete with all the fullness of life and power that comes from God. As much as it is almost impossible to SEE all of the Grand Canyon let alone hike, God’s love is so much greater. We will never fully understand it all on this earth. But oh the hope that fills this believer’s heart for the day when she will stand before God and FULLY UNDERSTAND the width and length and height and depth of my Creator, Lord and Savior. I love the bark of these trees. They are shaggy and quiver in the gentlest breeze. They looked beautiful covered with snow the other day. 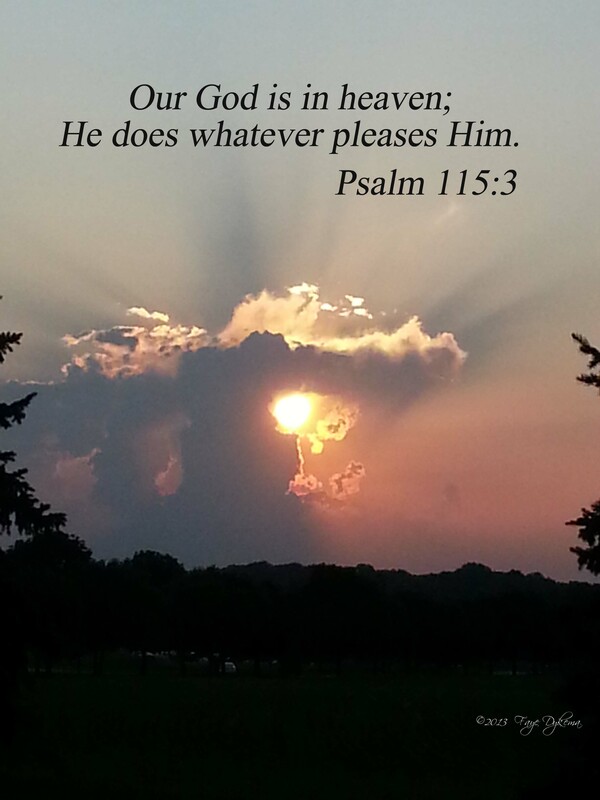 Today as I was considering this verse from Isaiah, I was drawn to this photo. 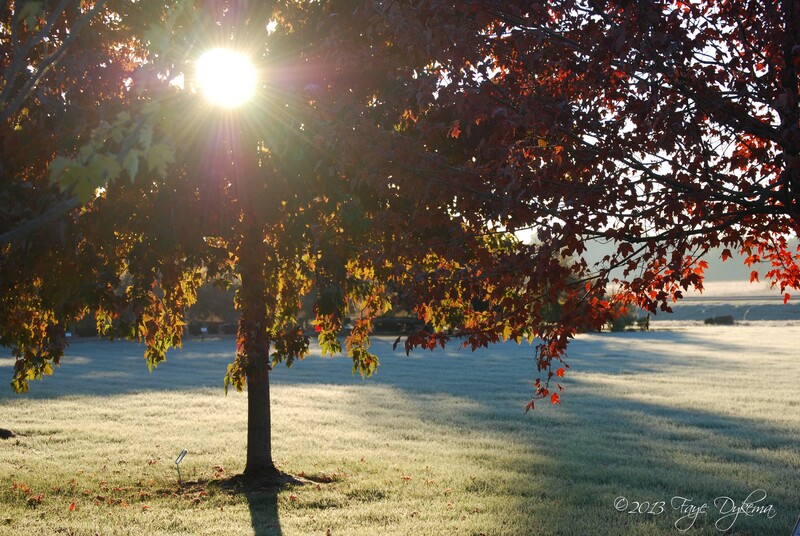 A simple tree seems to worship its Creator by the beauty of trembling and shedding its bark. Looking at comparisons, I realized the following: First, I too often approach God’s word without the humility of being before my Creator, trembling at being in the presence of His majesty. Second, when I am coated with God’s Word my own trembling, worrying heart is stilled by His love and grace. This is a very simple, short verse in the Bible, but as I thought about it I wondered, Do I tremble at God’s Word? Do I read it with utmost respect and humility, ready to be changed by even the simplest words or phrases? We have all heard the simple phrase, “Be still and know that I am God.” That phrase alone can change the hearts of the busiest or most hardened person. It reminds the believer to slow down and intentionally BE in the presence of God. I have been finding it harder to intentionally spend quality time with God. I rush through my five-minute devotional these days because of the busy schedule. I’ve been feeling these nudgings from the Holy Spirit to come back and visit God’s Word. It will give me strength, wisdom, perspective for the day if I don’t rush through the reading, but ponder and meditate on His Word. I’ve been rereading the devotional every day this week that includes this verse from Isaiah 66. I have been both encouraged and challenged in how I have taken God’s precious Word for granted. I am too often flippantly reading the words and marking of my time with God on my mental checklist. Instead I need to remember, especially at this time of year, the abundant love God has for me that 1) He knew me before I was born and has numbered my days, 2) He has incredible plans for each and every day of my life, and most important 3) He loved me so much that He GAVE His only Son to DIE for me! He allowed His Son to suffer the depths of hell so I could receive His incredible gift of grace and be assured of eternal life. Forgive me Lord for casually reading Your Word. Remind me of my inadequacy before You. Prick my consciousness so I am drawn back to spending time meditating and digesting Your Word for me each day. Fill me to overflowing with these precious gifts from Your hand. May you be blessed to Tremble at His Word today. A few days ago we had a beautifully, heavy, wet winter snow. It coated the trees and was inspirational. 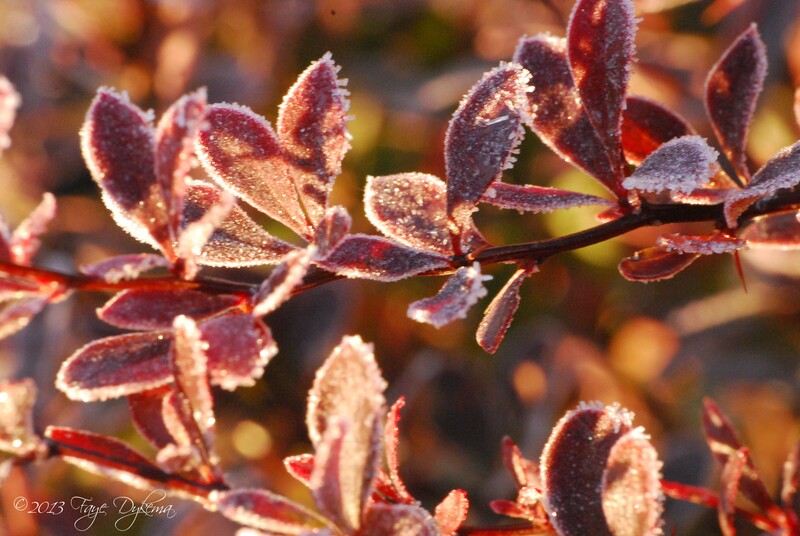 I headed out with the camera and was thrilled to once again enjoy such beauty. One of the pictures I’ve always wanted to catch was snow-coated trees with the contrast of the brilliant red cardinal. I was doubly blessed. It was breakfast time for the birds and there were a multitude of them at my friend’s feeder. There were many male and female cardinals that day – and I have multiple pictures to sort through from my adventure. 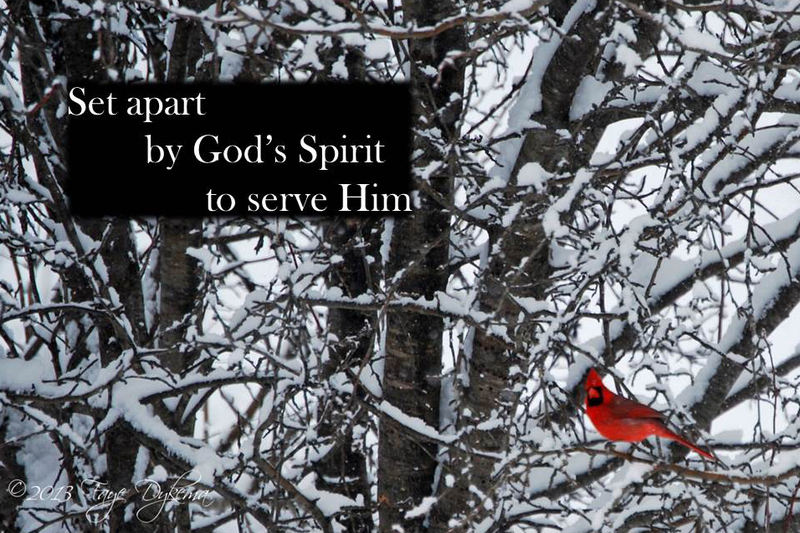 My mind immediately remembered one particular photo of a cardinal set against the snowy tree. The stark contrast was almost like the cardinal was superimposed on the tree. It definitely is set apart and stands out as a striking difference from the serenity of the peaceful tree. This being the season of Lent, Christians focus more often on the sacrifice God gave of His Son to die on the cross to save each one of us from our sins. Peter reminds us that we were chosen by God from before we were born to follow Him. When we believe in the resurrected Jesus Christ, we are filled with God’s Holy Spirit who guides us – our thoughts, actions and desires are set apart to honor God. As Christians our lives are to be set apart to honor Him. Several years ago I read this passage and was challenged to look at it from the perspective of standing up for Jesus – being boldly willing to praise Him publicly and “be willing and ready to share the hope that is within me.” As I looked at the variety of gems and minerals, I found myself thinking these stones, in all their splendor, are buried deep in the ground where man has to work to dig them out, clean them up and polish them to see their beauty. Yet even if they were never seen by man, God created them to cry out His praises. Can you imagine the fun God had creating a wide variety of shades of sapphires, emeralds, rubies, fluorite, quartz and the list goes on? They were created from His glory. How much more does He desire MY worship and adoration? He created us to worship and glorify Him. The Westminster Catechism reminds us the chief end of man is to glorify God and enjoy Him forever. We can enjoy Him through His ever-changing, beautiful creation. Have mercy on me, O God, have mercy! My God will send forth his unfailing love and faithfulness. and whose tongues cut like swords. 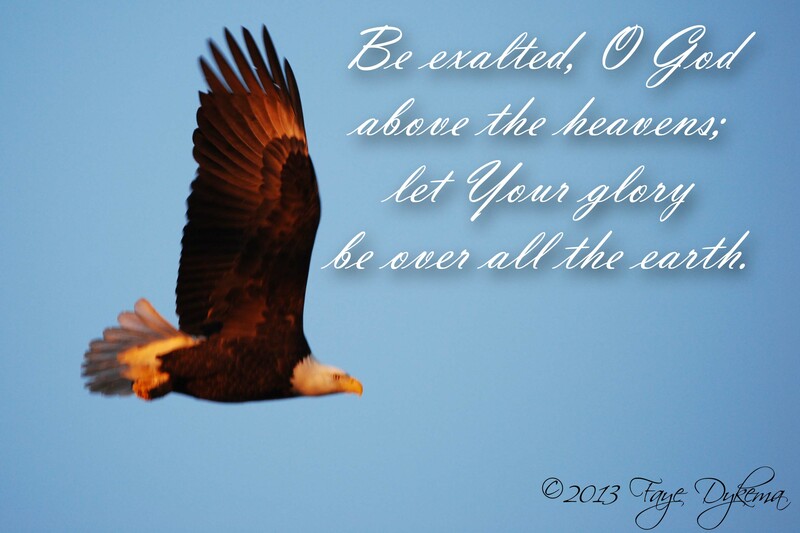 5 Be exalted, O God, above the highest heavens! 6 My enemies have set a trap for me. I am weary from distress. 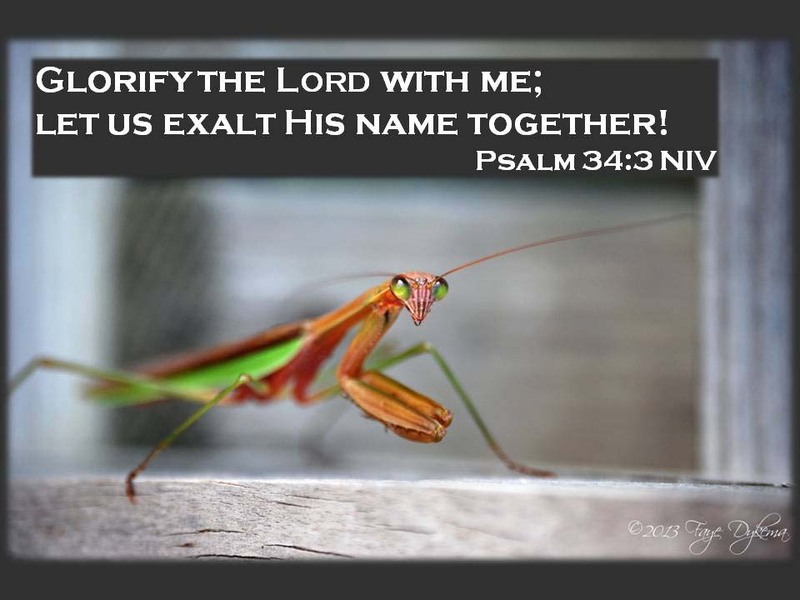 Funny – I read this first in the NIV version and it has the familiar word Selah in it twice, I didn’t realize it until I reread it in the NLT version where they had the word Interlude that it was there. But I don’t like Interlude. I like Selah. From research, it’s unclear what the Hebrew word really means, but from sermons and Christian education classes, I remember hearing Peace, Rest, Pause, or Reflect. It’s a break in a song – such as Interlude, so the NLT has the right meaning, but S-e-l-a-h just sounds like p-e-a-c-e stretched out forever; a long breath. I find these days that I have to really work to take Selah in my life. 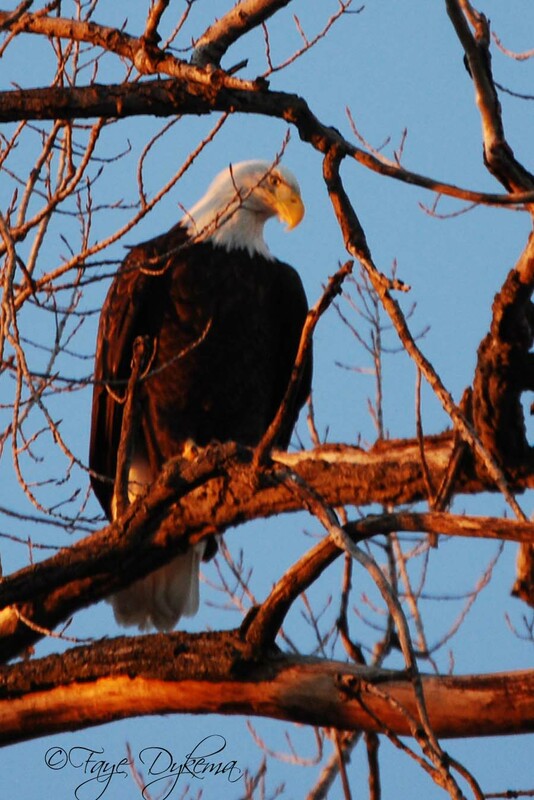 Recently, I was blessed to see an eagle high in a Cottonwood Tree and get quite close to it. As I slowly walked closer, I enjoyed its ever watchful gaze. I took 10-15 minutes to gradually approach the eagle. I felt like I was enjoying Selah with God and His creation. I was grateful to have my camera and was able to capture several great shots, including the eagle taking off from the tree and soaring away. As he took off, the shadow cast by his wings was huge. To be able to hide in the shadow of God’s wings is beyond comprehension. To hear the Psalmist say, “Be exalted, O God, above the heavens; let Your glory be over all the earth,” fills my heart with similar feelings that I get when I watch the eagles. The magnificence of the incredible eagle is inspiring. How much more should my God be to me? Like the Psalmist continues, “I will praise You, O Lord, among the nations; I will sing of You among the peoples. For great is Your love, reaching to the heavens; Your faithfulness reaches to the skies.”, so too, my heart soars with quiet praise to my God and Creator. I think the next time I enjoy an eagle soaring, I hope I will remember to take time and exalt God’s holy name above all things. 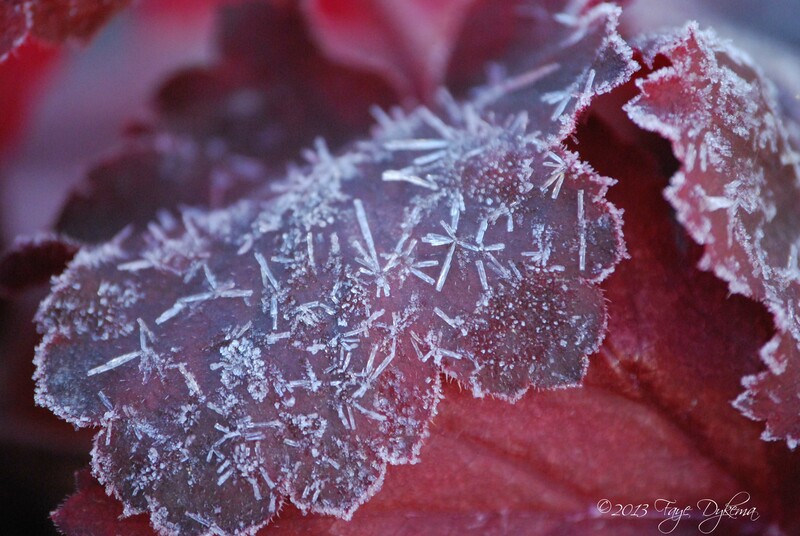 I love the beauty God provides in winter. Don’t get me wrong, I used to tolerate winter at best. I don’t like to be cold. Matter of fact, I can pick out a draft in the room before anyone else – just ask my family. My fear of slipping, falling and hurting myself is all too real. I don’t like dreary weather. 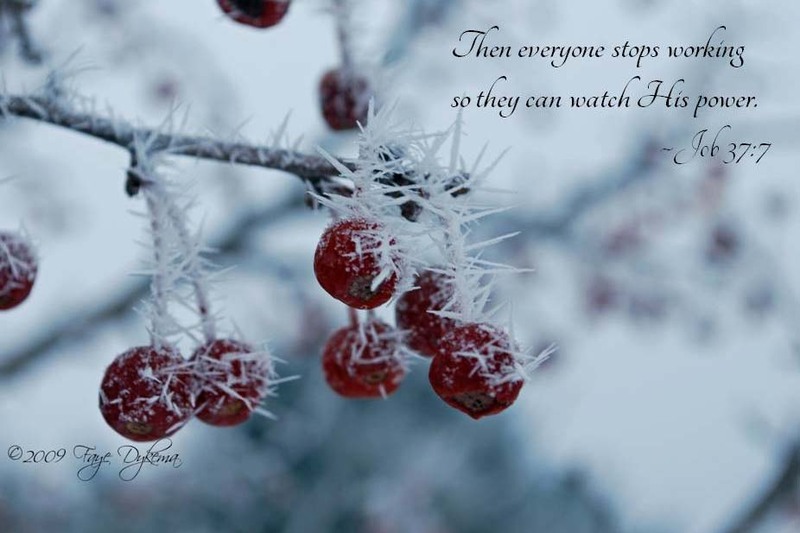 So why do I love the beauty of winter? The gloomy, cloudy days growing up in Michigan made moving to Iowa winter sunshine a real blessing. The blanket of snow provides an excellent means of “sneaking” up on animals to get a closer view. 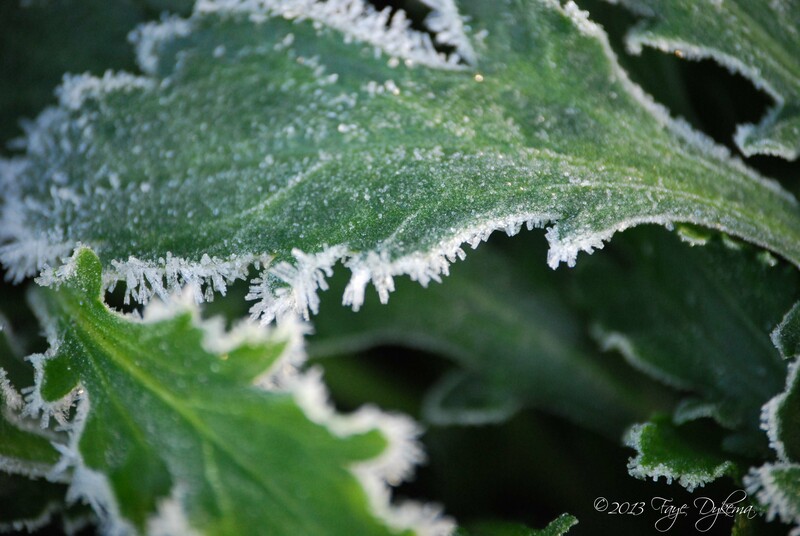 The intricacies that are created by God in winter are truly amazing. I just finished my 3 mile hike in the woods and down to the river. I heard woodpeckers, saw an owl, peregrine falcon, eagle and evidence of deer, rabbit, raccoons and otters. Then there was the wonder as the ice has begun to melt and hangs up about 2 inches above the river, making incredible patterns and shapes. There are bubbles in the ice. The birds are gathering around birdfeeders. Cats are sunning themselves in the sunny windows. The clouds churn about at His direction. 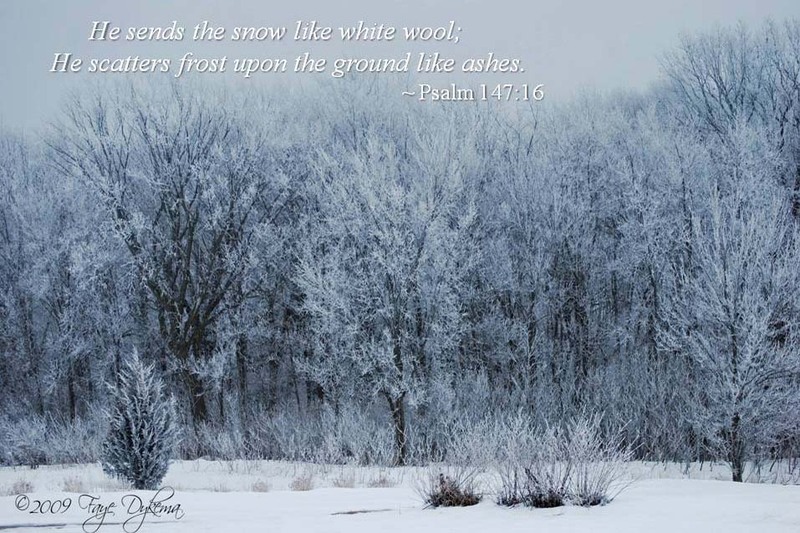 He scatters frost upon the ground like ashes. He hurls the hail like stones. Who can stand against His freezing cold? Then, at His command, it all melts. 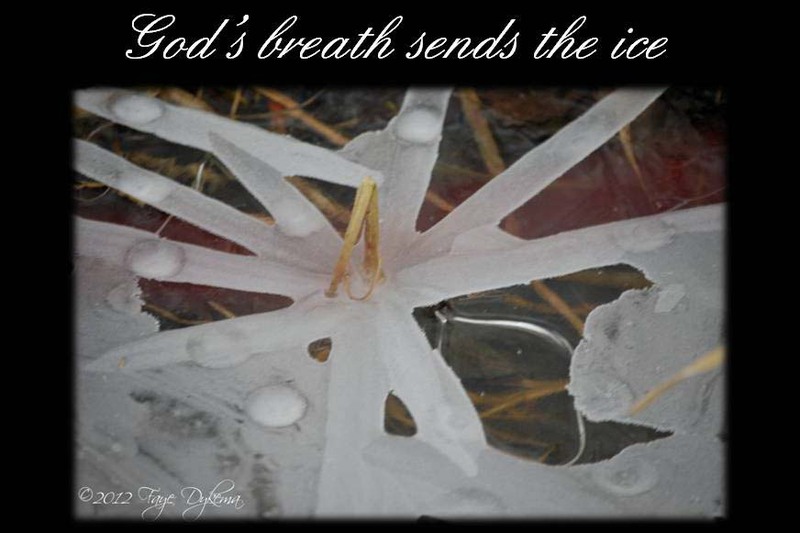 He sends His winds, and the ice thaws.